Fast-moving. Risk-taking. Rapid-fire innovation. It’s a startup, of course…or is it? Lately, I’ve been seeing organizations of all ages and sizes claim for themselves that elusive magic that feeds innovation in startups. Their motives are clear: the Fifth Industrial Revolution demands that businesses innovate or die and get the right talent on board. Today’s new products and services are being rendered obsolete more quickly than ever. To stay ahead, your organization simply must become more adventurous and entrepreneurial in its thinking, and more nimble in executing new strategies and driving an entrepreneurial culture. Fortunately, contrary to the hype, you don’t need to be a 19-year-old social media prodigy (hello, Mark Zuckerberg) to cultivate those resources. Eureka moments can’t be forced, nor can agility. Yet, both can be nurtured in the right environment. And it seems many forward-looking workplace leaders are getting the memo: a recent survey found the second-highest priority for innovation leaders in 2018 is to spur cultural change. Create an incubator to spark entrepreneurial spirit. What do a garage, coffee shop and dining room table have in common? These are the new ideas’ sparking spots, and frequently commandeered by teams or entrepreneurs to dream and plot out the next big thing. Wild ideas need room to spark and grow. Offer a specific space dedicated to creative thinking amongst your internal teams, where customers or third-party entrepreneurs can potentially also convene. In addition to sparking new ideas, an in-house incubator can help engage talent if you open up the space for collaborators to pursue personal passion projects there, too. For example, one insurance company found that its designated “innovation garage” provided a change of scenery that helped people find new perspectives on their ideas. Consider also the potential value of funding startups and mentoring entrepreneurs with innovative projects with your service providers. These types of partnerships not only enable innovation, but also send the signal to your core teams that you encourage innovation in all areas of the organization. Invest in relevant technology to fuel agility. Artificial intelligence (AI), machine learning, deep learning and advanced robotics aren’t just assets for the IT team—practically every innovation can be supported in some way by these rapidly advancing technologies. For example, equipping teams with access to the big data sets and advanced analytics tools they need saves major research and development time, speeding up the time to market of the best ideas. Meanwhile, things like 3D printers can help people test an idea and its execution, in real time, before a prototype is build and potentially sent back from some remote locale. Use workplace design to show trust and understanding. Bold ideas can be hard to come by when people don’t feel free to pursue them. Entrepreneurs don’t need to worry that their every move is being scrutinized, and neither should bright employees and on-demand talent. Our research shows that, when equality, transparency and visibility are embedded into the environment, people become more engaged and empowered to do their best work. Big companies can inspire entrepreneurial thinking precisely by giving people the freedom to choose from a variety of functional work environments, based on the task at hand. 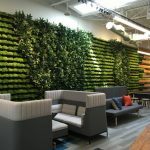 For example, a free-thinking workplace might include quiet zones and team huddle rooms, as well as spots for meaningful healthy collisions—those chance encounters that can lead to surprising new ideas. And because some of the best ideas come after (or during) an adrenaline rush, you might also consider an update to the company wellness center, or offering a free yoga class onsite. Champion innovation at all levels of the corporate ladder. Great ideas can come from any department, at any level of experience. Your managers can actively encourage innovation by creating a clear pipeline for sharing new thoughts, and also by making themselves accessible for constructive feedback. At the same time, managers can “walk the walk” by actively using incubators or maker spaces themselves. Their participation can help people at all levels of the organization understand that outside-the-box thinking isn’t just worthy of on-the-job time—it’s desired. Mix things up with other people. Sometimes all it takes is a fresh perspective and an inspiring environment (that great comfy chair you feel so comfortable in) to help tease out a new idea and think, or inspire a different tactic to an old problem. 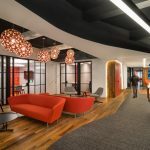 That’s one reason FlexSpaces and co-working are becoming new networking models for businesses, including options with third-party providers like WeWork or Carr Workplaces—or even in-house co-working spaces, as we’ve seen with Honeywell, IBM, Nike and Microsoft. More than just a different physical setting, co-working spaces provide a social outlet specifically designed to facilitate the flow of ideas and new ways of thinking. Is your workplace set up for big ideas? The future of work is being constantly rewritten as we speak. To stay ahead, organizations of all sizes must master creative thinking and agile execution. By leveraging the high capabilities of your large organization, and incorporating the best practices of a smaller one, you can create a healthy, stimulating environment that inspires your people’s best ideas—and actions. To your first point, Marie, about creating an innovation incubator: I recently spent some time googling for symphony orchestra scores that involve improvisation. I only found one, and that involved improvisation only by a soloist, not the whole orchestra. But jazz combos are characterized by improvisation. A culture that permits risk-taking and or even encourages failure is necessary, as you say, but a small interdisciplinary team is crucial.